Lacey (the chocolate) jerks up, ears alert and forward, nose twitching. 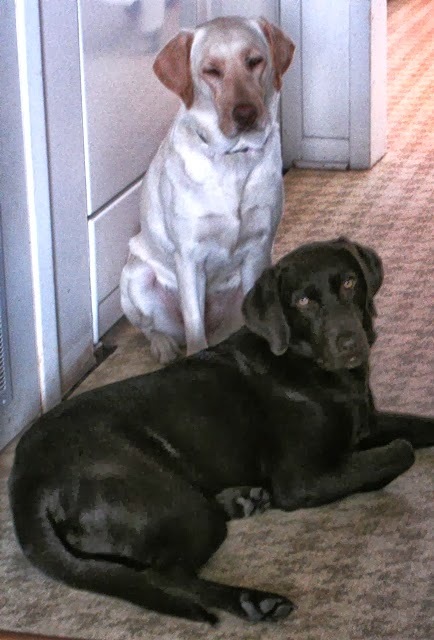 Cagney (the blonde) runs through the kitchen with deep questioning growls. How could she even know what the other one was doing in the living room. And nothing was happening anywhere. My husband is out and will be gone for several hours with no definite time of return. Three minutes before he pulls into the driveway, my dogs start running from window to window, pushing the blinds aside in front of the sliding glass door and all around noisily announcing that he will be home soon. They don't stop until he has walked inside the door. How will I know if there is going to be an earthquake if this is how they behave when he just pulls into town? When Lacey wants to go out, she sits next to me, taps me with her paw, and when I look, she leaps straight into the air, flips both rear feet high up on one side and lands like a bucking bronco. No matter how many times I ask if she has to go out, she will just sit and look at me like I am deranged. Apparently, she does not believe in repeating herself. Outside Cagney is the aggressive dog. Inside Lacey takes control. What did they do, draw up a contract? Cagney runs around the backyard with her bottom tucked nearly beneath her, tail practically non-existent, a regular golden blur. Lacey races the same track, legs flying out to her sides, tail out like a flag tail deer, ears flapping and beats Cagney to the door. How? She has so much wind drag she should be taking air and circling the yard. When asked if she wants more water, Lacey gives me her paw. Cagney shoves her nose in her water dish. If I ask Lacey again if she wants water, Cagney will put her nose in Lacey's water dish. Lacey sleeps with my daughter. In the morning, if my husband or I try to let her out, she will not exit the bedroom until our daughter climbs out of bed and walks her into the hallway. We know who pooped in the wrong place because one stays in one place and the other walks around leaving a trail. Lacey will not use the back steps, even if it means taking a header every time she goes out and must leap from the doorway to the brick pathway below, avoiding the three steps down that would be so much safer. My daughter's bedroom is up a flight of thirteen steps. It took Lacey six months before she learned to go down the stairs without ending up a ball of tumbled dog at the base. Going up was no big deal, even exciting, but heading down in the morning, well, it was a good thing Cagney was willing to catch her at the bottom. Cagney gets the greatest kick out of my husband. All he has to do is grab the back of the dining room chair and lean it toward him. Cagney will spring to her feet and go into attack mode, a wide-mouthed grin spread across her long snout. Don't get me started with how she reacts if he pulls his t-shirt up to cover his face below the eyes. When Cagney pretends my husband is a burglar (t-shirt collar pulled up to his eyes), Lacey will nip at Cagney's feet until she agrees to play with her instead of him. So what are your four-pawed friends doing to keep you content and entertained?